NEW YORK – BlackBerry has completed a dramatic shift from being one of the world’s most well known mobile device manufacturers, to becoming one of the top global software and security companies. Speaking during his keynote at the company’s fourth annual Security Summit in New York City, CEO John Chen explained that BlackBerry has spent the last four years shedding its handheld device image and putting together a comprehensive security platform for devices ranging from cell phones to vehicles to everything in between. 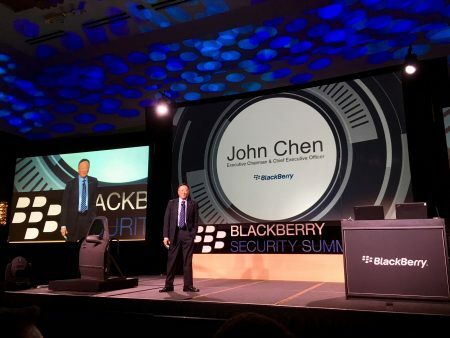 BlackBerry CEO John Chen during his keynote at the BlackBerry Security Summit in New York City on Nov. 14. BlackBerry has had an impressive year, with Chen reporting record software and services revenue, record gross margins, as well as non-GAAP operating profits across all segments and $2.5 billion USD in cash. “We’ve had a strong year and we’re going to continue with our strategy of becoming a major ecosystem player that works with system integrators, software, and hardware to make sure technology is embedded in as many things as possible,” he said. Addressing what’s next for the company and several new emerging innovations in his keynote, Chen pointed out that with its “tremendous amount of technology”, BlackBerry is looking into blockchain technology. With further research and development going into blockchain technology, Chen said that it’s becoming more likely that BlackBerry will enter the space. Secure platforms and operating systems for autonomous vehicles have also been highlighted as a priority for the company, with BlackBerry partnering with the city of Ottawa to test drive Canada’s first driverless car on a public road in October. And because of its robust autonomous vehicle focus, if one supplier embeds blockchain technology into its component, that means the BlackBerry operating system and security platform will need to be blockchain-enabled, Chen added. 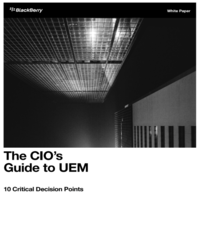 When it comes to “getting back on top” in the mobility space, Chen noted that the company is looking to regain ground, although it is staying on the security side of things and away from manufacturing the devices.